Mio Navman S555 Hands-free Traffic, with UK and Ireland maps, takes widescreen navigation even further - to an impressive 4.7-inch screen size, yet still remains an ultra-slim, beautifully streamlined body. Beneath the stylish, lightweight frame lies Spirit, Mio's breathtaking new software that incorporates the elegant Slide Touch operation. Menus and maps glide across the screen allowing you to access a wealth of navigational features with fewer clicks. Mio Navman S555 Hands-free Traffic Bluetooth is built-in, plus, enjoy all of the features above with the added benefit of real-time Traffic. Mio Navman S555 Hands-free Traffic has been discontinued. 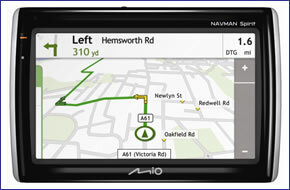 The Mio Navman S555 Hands-free Traffic from Mio features maps of UK and Ireland. The Mio Navman S555 Hands-free Traffic also features a pixel-perfect 4.7-inch touch widescreen display, Bluetooth, TMC traffic receiver for subscription free real-time traffic information, points of interest and speed cameras. The Mio Navman S555 Hands-free Traffic features turn by turn navigation with voice guided instructions and a full 8-digit UK postcode searches with 2D and 3D moving map display. Plus, with the Mio Navman S555 Hands-free Traffic, you can navigate via images with 'NavPix'. Over the years GPS maps have become more complicated, so Navman took the bold step and redesigned theirs from scratch. The result is TruMap™, a unique design inspired by paper maps. With simplified graphics and colour for a clutter-free look that’s easier to understand. The natural white background allows your route to stand out, so you can see your way at a glance. At dusk, the screen automatically switches to night mode and brightness is reduced for safer driving. With the Mio Navman S555 Hands-free Traffic Lane Guidance, you’re always in the correct lane to make a turn, so useful with today’s busier roads. The Spirit software also features realistic 3D Junction Views that match major road signs, giving you more time to understand what’s ahead as you approach an exit or intersection. Avoid hold-ups and congestion. Using the very latest traffic technology, the Mio Navman S555 Hands-free Traffic gives you real-time traffic information so you’ll always know what’s on the road ahead. The full potential of the Spirit planning software is unleashed when you connect the Mio Navman S555 Hands-free Traffic to your PC with MioMore™ Desktop 2. Easily plot your routes, upload NavPix and other geo-tagged photos, connect to online services, customise your own POIs and update maps and safety camera locations. Pre-loaded into the Mio Navman S555 Hands-free Traffic are Travel Books from Wcities. Browse the in-depth listings of tourist attractions, places to eat, stay and visit, full of facts and photos. There are hundreds more to choose from, all quick and easy to download when you connect to MioMore™ Desktop 2 via your PC. The Mio Navman S555 Hands-freee Traffic works brilliantly both in and out of the car. Walking Mode, developed to help you find your way around major cities on foot with buildings outlined for easier navigation. By helping you discover new places not accessible by car, Mio takes navigation a step further. Now you really can explore more. With the Mio Navman S555 Hands-free Traffic's built-in NavPix™ photo album, you can browse through a huge variety of pictures such as tourist sites, hideaway beaches, hotels and restaurants. And connect your Navman to your PC to upload from over a million geo-tagged photos, free on the NavPix™ and Flickr® websites. Then simply touch the picture on your Navman and it navigates you there. The Mio Navman S555 Hands-free Traffic Economical Routing option assesses and reduces the number of junctions on your chosen route, so you can cut down on stopping and starting, fuel usage and also help lower your car’s CO2 emissions. Pre-loaded safety camera data helps keeps you on the right side of the speed limit. If you’re speeding or approaching a camera, a visual and verbal warning gives you time to safely slow down. The Mio Navman S555 Hands-free Traffic can also flag up the speed limit of the road you’re on, encouraging safer driving. Mio Navman S555 Hands-free Traffic has been designed to be Plug and Play, and as such can be transferred from vehicle to vehicle with ease by the user. The Mio Navman S555 Hands-free Traffic UK and Ireland is powered with a 12-volt adaptor cable in-car (supplied) and attaches to your vehicles windscreen via the Mio Navman S555 Hands-free Traffic suction mounting bracket which is also included. Mio Navman S555 Hands-free Traffic UK and Ireland includes a free preloaded trial to speed camera locations. Subscribe to monthly updates of speed camera locations for the United Kingdom. Subscription to the Navman UK speed camera database is priced at £24.95 for 1 year or £49.90 for 3 years. The Navman Western European speed camera database is priced at £49.95 for 1 year. Mio Navman S555 Hands-free Traffic comes complete with the latest Navman TeleAtlas maps providing street level maps for Great Britain and Ireland.